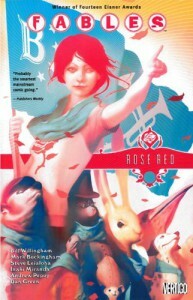 Hey, remember when Rose Red was bedridden and sidelines for months because of the death and romantic rejection of a dude she liked? Wasn't that awesome? This volume had highs and lows for me. 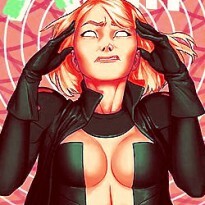 Lows being the continued fuckery that is Rose Red's mental breakdown, which she overcomes in this volume only to play...like no important role in the resolution of the storyline whatsoever. Highs were definitely Frau Totenkinder's transformation from conniving old crone to badass wizard-fighter, and her admittedly awesome magical duel with Mister Dark, which was almost enough to make up for the crap with Rose...except that her role in the arc ends when she finds a nice dude to settle down with, and removes herself from the active duty roster. Because really, isn't that the goal of EVERY woman: to find a nice man to settle down with, and then forfeit her agency. I'm pretty sure.